Please enter the CWR 2019 by completing the form below - after reading the instructions below the form! Additional information? Please include if willing to be leg captain. The CWR has been a regular fixture on the AA's calendar for a number of years and has really grown in popularity within the club. It is a very social event, and a great way to meet other members. I plan to this year again enter 5 teams, 1 ladies team plus 4 mixed teams. Chances are we will have more people interested than our 50 runners places so I will be as accommodating as possible. There will inevitably be a reserves list. I will not pitch for a 6th team this year. For those new to it, it is a one-day event, this year on Saturday June 29th, I am awaiting confirmation from Team Bath, the organisers as to the date. 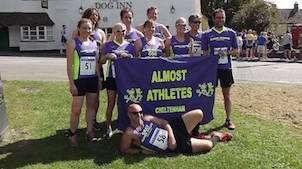 Teams of runners from many local clubs tackle the entire Cotswold Way from Chipping Camden leaving at 7am, through to Bath, finishing in the early evening - a total of 104 miles. Without wanting to put anyone off though, it is an unmarshalled & unsigned event over some pretty hard terrain in places and there are "sometimes" grazing animals. But fear not, each leg will have its own AA Leg Captain to get everyone ready for the day including most importantly recce run(s) of your leg. The recce runs are great fun and very social too. Last year we held a celebratory picnic a few weeks after the event. Could I politely ask that if you are planning to put your name down, you check & recheck any possible clashes you may have first & that if you do enter, you do your absolute upmost to honour the commitment. If you are carrying a long-term injury, you may need to think hard about it as this is a team event where withdrawals do mean a lot of work to re-jig things for myself & for the organisers. Feb 11th - Deadline to enter by. This will be an absolute fixed deadline. Mar 11th - First draft of teams issued. Mar 31st – entry fee to have been confirmed – see below. May 31st – Withdrawals after this date will not be reimbursed by incoming runner – see below. June 29th – Run ! Cost this year is TBC but last year was £17.50 each, this includes a Tech Tee Shirt. I have contacted the organisers to try & find out when we know what it will be for 2019. I have asked to know by March 31st to make the above timetable work. So, fingers crossed. The deadline for payments will be Friday May 3rd. Any payments not received by this date will see the runner removed. No exceptions. Should I get a later confirmation of the cost by the organisers I will review this date but it will still be absolutely fixed, whatever it is. You enter via Almost Athletes, not with the organisers. The entry form is (directly above) on the Almost Athletes website in the Races/Events drop down. This bit is new for this year. Any runner withdrawing for whatever reason after the teams have been issued will be replaced by a replacement (obvs). If the withdrawer has paid their entry fee, the replacement will pay their fee to the withdrawing runner. If the withdrawer has not paid, the replacement will pay their fee to the club as normal. Anyone withdrawing after May 31st will not be reimbursed by the new runner. The new runner will get an FOC place. They may however not get their tee shirt size of choice. For leg preferences I will l be as accommodating as I can but no guarantees. If you absolutely can only run a certain leg, include this on the form in additional info. If I cannot get you on the leg, I won't include you. Any members who have only ONE or TWO legs needed to complete all ten should note this on the additional info please. But it is often quite out of date. Any questions please speak with Dave Chittock. For written contact with me, please email me only at Davidchittock66@gmail.com. No facebook posts, messages, texts, flag signalling or notes through my letterbox.